THE FACTS – Despite multiple international protests, the positions adopted by official bodies such as the IACHR or the United Nations, or the Nicaraguan government’s ostensible offers of “peace and dialogue,” there has been no letup in the attacks, threats, insults, harassment and both criminalization and defamation campaigns against women defenders that began with the April 17 launch of a campaign of repression and violence by government forces and paramilitary groups against the mass protests against plans to make changes to the country’s social security system (INSS). Somoto human rights defender Carla Verónica Cáceres has received threats directly and on social media from leaders of the governing Sandinista Party, who are accusing her of promoting the protests and threatening to take actions against her. Amarilis Eunice Acevedo, an ASODEL member working with young people and participating in the student movement, has been regularly followed by motorized police and her motorcycle’s tires have been brazenly punctured. 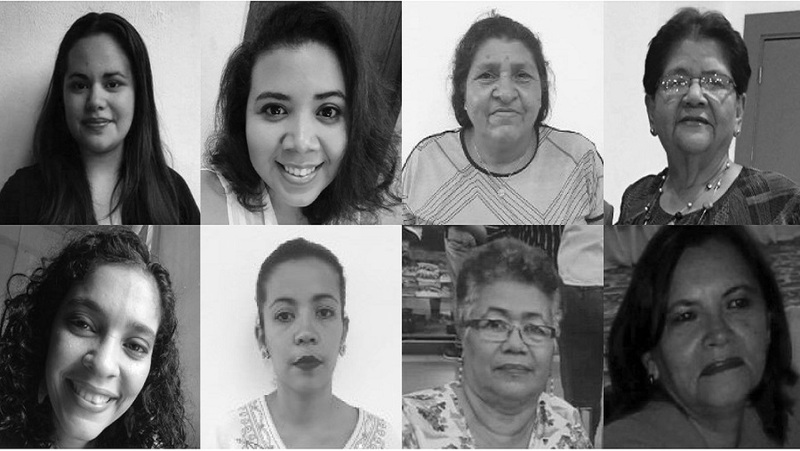 María Castillo, María José Díaz Reyes, Tania Quintana Mongalo and Melba Mongalo are the victims of a smear campaign of criminalization and defamation through a Facebook page on which they have been accused of supplying arms, bombs and money for organizing a coup d’état. The same page has published the home address of Tania and Melba, which was raided by armed police and remains under watch with motorized police recurringly passing by at all hours of the night with sirens blaring. ASODEL Director Maria Jose Díaz, has also been subjected to threats, insults and personal affronts by an individual who on Facebook called him an “abuser” after having been charged and served time for that crime. Rural women’s leader Petrona Pérez has been attacked since she denounced the clear cutting of the Cosiguina volcano in December 2017. Sandinista Front members have been harassing her in an effort to silence her. On April 27, two Sandinista Front members and a municipal official physically attacked her on the street while screaming at her for supposedly being responsible for two deaths in Managua, a reference to two people who were killed in the nation’s capital during student protests. Three days later one of the same people tried to run her over with a motorcycle. In the past month there has been an intensification of the smear campaign that Local Network leader Luisa Molina has faced for quite some time in which she is constantly made the target of insults and accused of stealing money or being in charge of the Coordinadora Civil, accusations that are repeated in the local press. 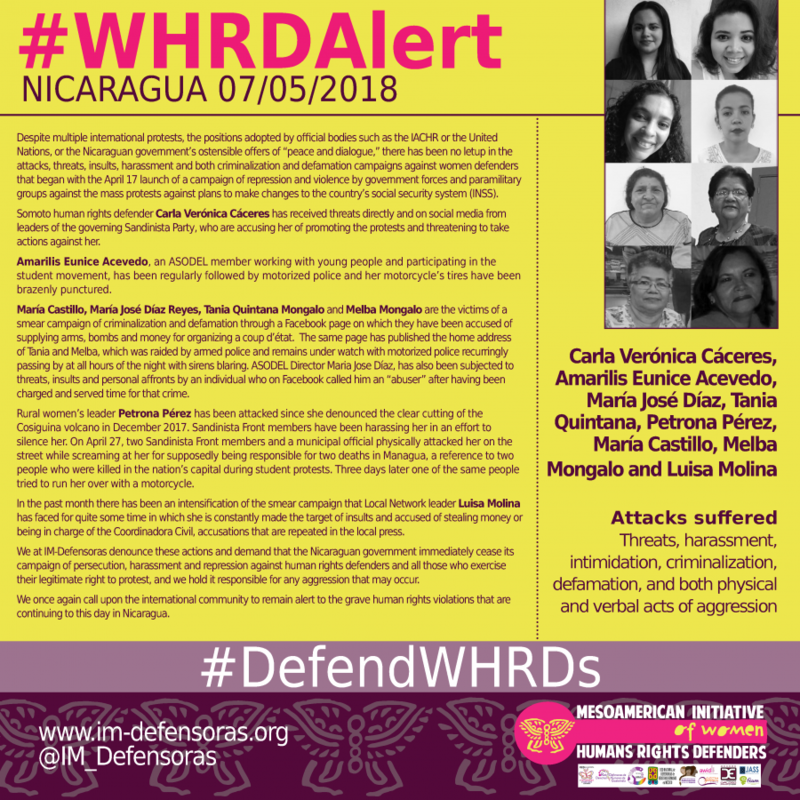 We at IM-Defensoras denounce these actions and demand that the Nicaraguan government immediately cease its campaign of persecution, harassment and repression against human rights defenders and all those who exercise their legitimate right to protest, and we hold it responsible for any aggression that may occur. We once again call upon the international community to remain alert to the grave human rights violations that are continuing to this day in Nicaragua.